Dubai’s reputation as a preferred international investment destination is gaining further traction as ambitious long-term development plans for the emirate start to come to fruition. The Dubai Investment Week, a five-day conference currently being staged in Dubai, aims to reaffirm the emirate’s status as a top choice for overseas investors. Fahad Al Gergawi, CEO of Dubai FDI, revealed ahead of the event that the city attracted 247 new investment projects and US$6.94 billion in foreign direct investment (FDI) in 2016. Dubai ranks seventh worldwide in terms of FDI, Al Gergawi recently told local media. At the same time, the city ranks third globally in terms of its new investment initiatives. He attributes Dubai’s ability to attract foreign investment to its world-class infrastructure, combined with the government’s progressive and innovative approach to diversifying its economy. Dubai Investment Week aims to provide the global investor community with insight into the future of investment in all vital sectors that support the objectives of the UAE National Agenda 2021 and the Dubai 2021 Plan, says Al Gergawi. More than 1,000 delegates from around the world are expected to attend this week’s event, which builds on the success of the one-day Dubai Investment Forum, which has been organised by Dubai FDI over the last two years. “The Dubai Investment Forum attracted 450 participants in its first year and more than 600 in its second year in 2016. The feedback we received from participants convinced us that we need a wider format, to focus on each of the critical aspects of investment attraction, including investor awareness, opportunities, promising sectors, policy reforms and public-private partnerships,” explains Al Gergawi. Investment is a major driver of the bilateral engagement between the UAE and the world’s fastest growing economies, stresses Al Gergawi. The US, UK and India are among the top FDI source markets for Dubai, while China has rapidly emerged as one of the UAE’s most important trading partners. “The Dubai Investment Week will draw on the existing as well as emerging pattern of bilateral engagement. In fact, the penultimate day of the week is dedicated to a Dubai-China Investment Forum to allow the sides take a close look at leveraging Dubai as a hub and gateway for regional and global expansion,” Al Gergawi explains. One of Dubai’s biggest investment markets is real estate, with residential, hospitality and commercial property holding strong appeal for the global investment community. Indians remain the most prolific foreign investors in Dubai realty in terms of volume and value, with 6,263 Indian buyers making $3.27 billion-worth of property transactions in 2016, according Dubai Land Department (DLD) figures. This is a sizeable chunk of total investment in Dubai real estate last year, which reached $24.77 billion from 55,928 investors, DLD figures reveal. “The UAE's safe-haven status and stable economic growth have been the key factors for attracting Indian realty investments in Dubai. In addition, many Indians find Dubai as their base for business between India and the wider Europe and Middle East,” explains Dawood Al Shezawi, CEO, Strategic Marketing & Exhibitions, which organises the International Property Show. India was one of the key source markets for investors at this year’s Cityscape Global, where total sales of off-plan properties hit $236.8 million, according to the DLD. A steady stream of sales is anticipated over the next few months off the back of the show’s success. More than 45,500 delegates attended Cityscape Global 2017, up 20 percent year on year, according to event organiser Informa. At this year’s event, which ran over three days (September 10-13), developers were allowed to sell their UAE-based projects, marking the first time this had been permitted in the event’s 10-year history. In previous years, local and international developers could showcase their projects, but sales were prohibited until after the event. Exhibitors recorded their sales in accordance with the rules and regulations of the DLD and municipality authorities. 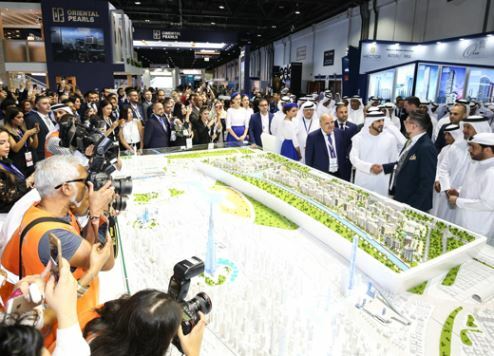 “It was encouraging to see such an influx of participants this year, and with the number of deals being made on-site,” says Cityscape Global exhibition director Tom Rhodes.